In 10-inch skillet, cook sausage over medium-high heat 8 to 10 minutes, stirring occasionally, until no longer pink; drain. Spray 3 1/2- to 4-quart slow cooker with cooking spray. In cooker, mix sausage and remaining ingredients except beans and basil. Stir in beans. Increase heat setting to High. Cover; cook 15 minutes longer. Garnish with basil. 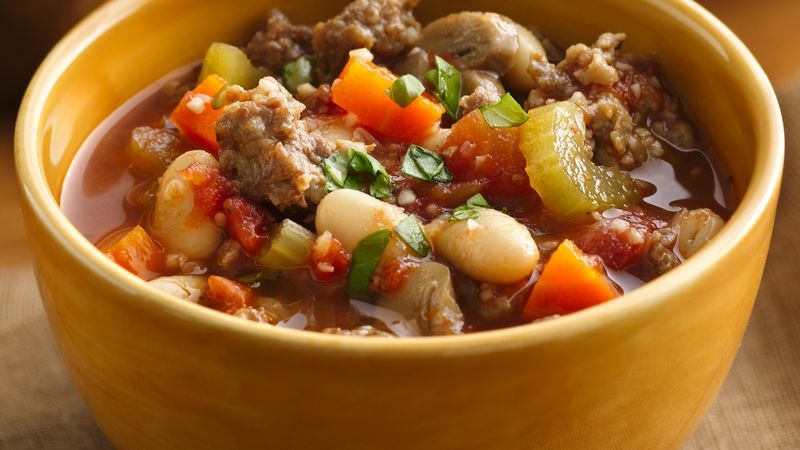 This stew is also great with spinach or cooked pasta, such as penne or macaroni. If desired, stir in 1 box (9 oz) frozen chopped spinach, thawed and squeezed to drain, or 1 1/2 cups cooked pasta along with the beans and basil. Mild Italian sausage is also known as sweet Italian sausage. If you happen to find it sold in links instead of bulk, gently squeeze the sausage out of the casings and discard the casings.